Martin Shkreli is the poster boy for outrageous drug price hikes. Shkreli, a former hedge fund manager and CEO of Turing Pharmaceuticals, bought a drug called Daraprim used by cancer and AIDS patients and raised its price by 5,000% overnight. The thing is, he's hardly alone. A new analysis by an activist group called Hedge Clippers shows that at least 19 other drugs have experienced stunning price hikes of between 300% and 1,200% in just the past two years. "It's not just one unethical guy. It's this broader winner-take-all mentality in hedge funds and private-equity firms that is infecting public health," said Michael Kink, one of the leaders of the Hedge Clippers and executive director for the union-backed Stronger Economy For all Coalition. 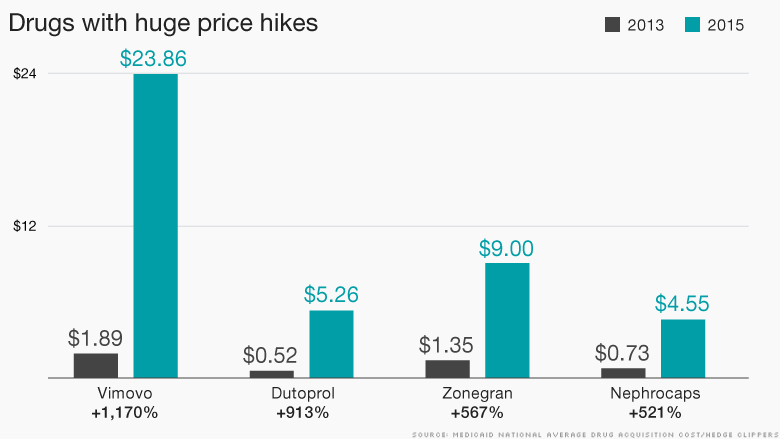 The most stunning price increase occurred in an arthritis drug made by Horizon Pharma (HZNP). 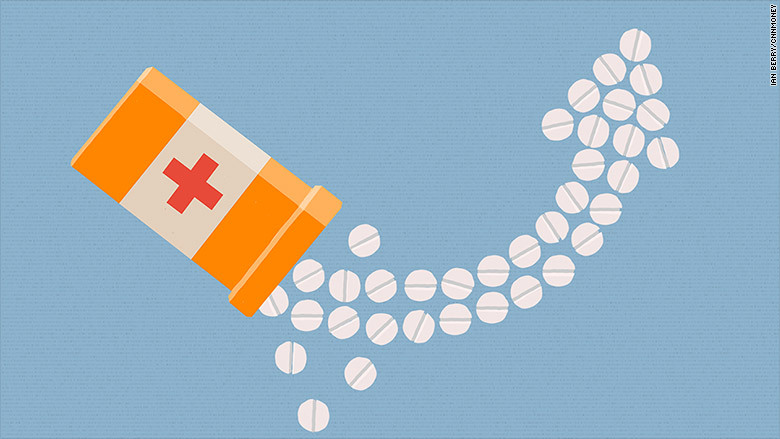 The cost of each Vimovo 500-20 MG tablet went from $1.88 in 2013 to $23.86 this year, CNNMoney confirmed. That represents a surge of about 1,170%. Horizon told CNNMoney that pricing is not -- nor has it ever been -- a key driver for its business. The company said 97% of all Vimovo patients pay $10 or less out of pocket (which still represents a 430% hike from the previous price). The patients who pay the sticker price are those that don't have health insurance. In general, insurance companies negotiate a discounted rate. Valeant Pharmaceuticals (VRX) owns nearly half of the top 19 drugs with the fastest-rising prices. For example, the price on Parkinson's drug Tasmar has surged 575% since 2013, while vitamin deficiency drug nephrocaps rose 523%. Last year, Valeant teamed up with hedge fund billionaire and major shareholder Bill Ackman to attempt a hostile takeover of Botox maker Allergan (AGN). "One of Valeant's major strategies is to optimize the price. That means to raise the price to what the market can bear. Not what is best for all stakeholders," said John Schroer, who leads healthcare stock coverage at Allianz Global Investors. "That is a short-term, maximize immediate cash flow strategy that does not invest in the business and will eventually come home to roost," Schroer said. Valeant declined to comment to CNNMoney. However, Valeant told investors on Monday that a large portion of its revenue growth came from more drugs sold rather than price hikes. Out of the 156 total drugs in Valeant's portfolio of U.S.-branded drugs, 85 had an average price increase of 24%, the company said. A group of private-equity firms sold Dutoprol to Concordia Healthcare (CXRX) in April 2015, after which it jacked up the price even more. The company said it raised the price in line with other drugs in its category. "Concordia does not take lightly the decision to change price and strives to ensure the patient is not affected," the company said. Kink conceded that private capital can "absolutely make a difference" by supporting cutting-edge research by drug makers. But that's not the case with these recent price hikes. "Something is deeply wrong when a small number of people can get rich by driving up the prices on drugs that thousands of people need to survive," said Kink. "Valeant's strategy just can't work long term. Now that all eyes are on them, they will change their behavior," Schroer said. Due partially to "recent events," Valeant told analysts on Monday that it's likely to "pursue fewer, if any, transactions that are focused on mispriced products."